Wedding - is one of the happiest, significantand memorable events in your life. And what a wedding can do without the lush wallpapers and fun entertainment? As mentioned by the ancient Romans, people want to "bread and circuses!" And the interesting spectacle can be one in which you can participate, especially if you can combine it with a feast at the table. The perfect entertainment - a variety of contests for the wedding table that will create a fun and relaxed atmosphere, as well as help your guests get to know quickly. During any wedding celebration beginswhen guests want a break from the congratulatory speeches, hearty meal. At this point, you need to entertain guests, inviting them to participate in the wedding-dinner competition. Wedding competitions and games should be a lot to every guest, if desired, could become a party to, showing his outstanding abilities, intellectual or physical. Competition at the table "Georgian toast." Before the contest, leading asks visitors to call any 10 words precisely characterize family life. For example:.. Love, understanding, house, diapers, pan, etc. These words are written in large letters on the plates. After that, two participants (men) give props: a cap, mustache, horn with wine. 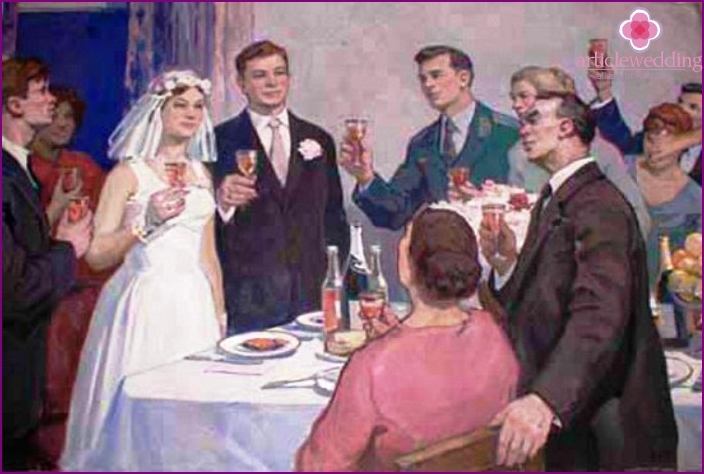 The essence of competition is simple: each participant is given the opportunity to impress the guests and Georgian bridal wedding toast. During toasts, usually in a completely unexpected moment, the leading picks on one of the plates, with written words. The task of the "Georgian toastmaster" to quickly navigate and mention the word in his toast, without losing "the Georgian" eloquence. Drinking contest "Gluing the heart." 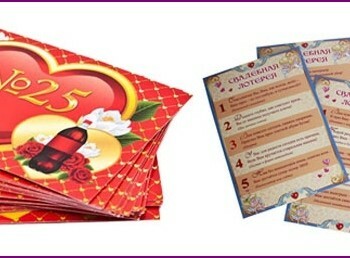 In conducting this competition you need a wedding hearts cut out of colored cardboard, preferably red or pink color. They should be cut into small (but not too small) part. Participate can be anyone at the table. The competition has a lot to do with the game, "puzzle". 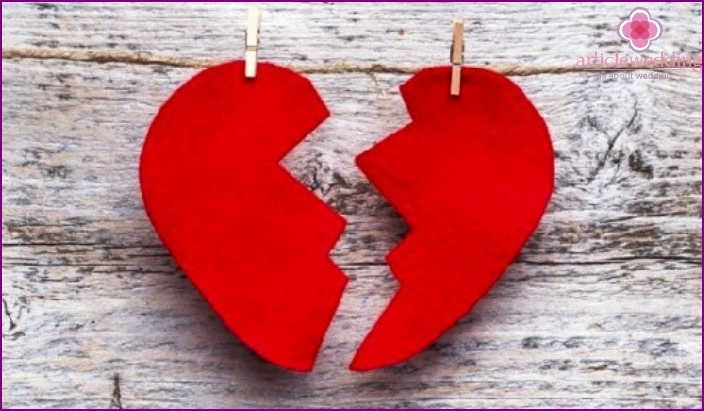 Presenter gives guests the part resulting from the cut of the heart, and each participant must on the table to collect the pieces together. At first it may seem like a difficult competition, but as far as games are easy to fold. The winner will be the one who will be able to quickly collect all the right heart. The game at the table "Family responsibilities". For this game you need to prepare in advance even number zapisochek twisted into a tube or folded a simple flower, and then put them in a basket. Notes should be a little bit. In general responsibilities are shared funny way, obliging her husband to cook dinner and wash the diaper, and his wife - to make money. Drinking contest "Merry alphabet." In carrying out its props are not required, but may take part all gathered around the table. Members one after the other in the form of congratulatory say they wish the young. 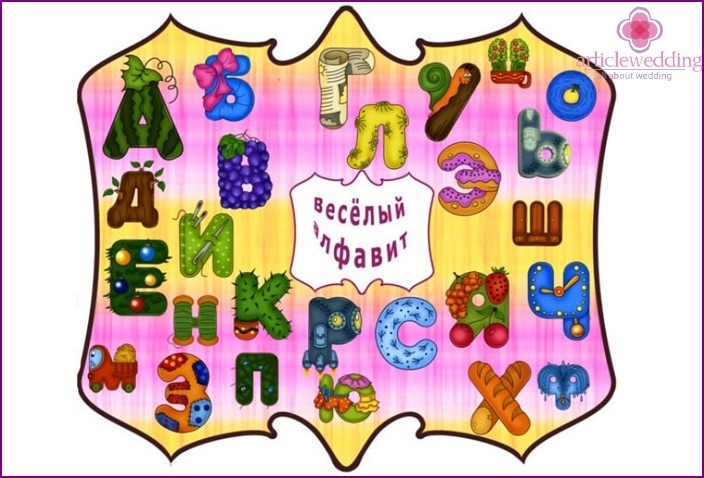 The main condition - the wishes and congratulationspronounced in alphabetical order. That is, the first must start with the letter "a", the second - with the letter "b" and so on through the alphabet. Usually already reaching the letter "e", "e", begins the most ridiculous suggestions. The game at the table, "Guess: Who are you?". In carrying out this game each participant sitting at the table, paste on the forehead paper sticker with a pre-written character. Will so that all the players can see the names of the characters of other players, but do not see her. The player's goal - to guess the character (personality), which is written on his forehead. Characters must be varied and fun, such odious personality, heroes of movies, stars, politicians, actors, and so on. D.
The characters can be: Terminator, Lady Gaga, Iosif Kobzon, Jack Sparrow, Boris Moiseev, Yulia Timoshenko, Nikolay Valuev, Sergei Zverev, Stalin, 007, Red Riding Hood, Ivan the Terrible, Tarzan, Shrek, Hitler, Masha Rasputina, Vladimir Putin, as well as other well-known all personalities and characters. Solving is done by probingquestions, such as "I'm a man? ", "I am a woman?" "I'm a singer? ", "I'm an actor?" and so on. n. Participants asked one question in a circle. The answer to the question is can only "Yes" to follow or "No". The winner is the one who first solves his character. If an error occurs when the name of the character the player receives a penalty a task that is required to perform. The task should be funny, for example, crow loudly or sing nursery rhyme. Brindisi game "Apple of discord". 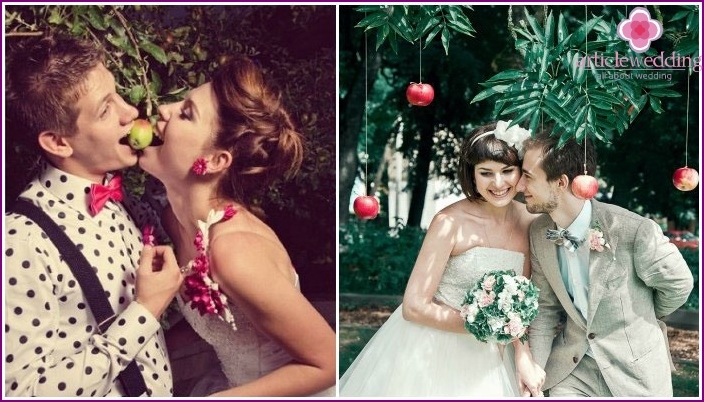 The bride and groom should not be bored for a long time, so was invented for their wedding game "Apple of discord". On the gum must be hung big beautiful apple, holding it over the young. This will be a symbolic "apple of discord". Newlyweds need to bite off a piece of it, without touching the fruit by hand. It is not easy, as the apple gum will sway from side to side, as if "running away" from the young. To perform this task, they will havegood try. Guests at this time should not be bored at the table, as "rooting" for the newlyweds. Apple should be eaten completely, in this way the young will learn to apply their efforts to prevent discord in family life. Wedding forfeits. To prepare for the competition inflate balloons in an amount corresponding to the number of guests. In each ball put a note with tasks. It is advisable to have the job simple and fun, for example, lezginka dance, sing, tell a poem, draw an ostrich, to make a toast, and so on. D. The bride gives the guests at the table balloons. Witness suited to each guest, and eats the ball. Guest retrieves the job and executes it. In case of failure - fine. Be sure fun competitions for weddingguests at the table like everyone and create a sense of celebration. The main thing that they were fun, funny and ridiculous. Nobody will be bored if everyone will be able to participate in them. Merry your wedding! A video below will help you to realize their wildest ideas.